Today we added the ability for you to upload custom hold music to your Telzio phone system. This exciting feature enables you to implement customized messages into callers' hold time, and update the messages anytime. 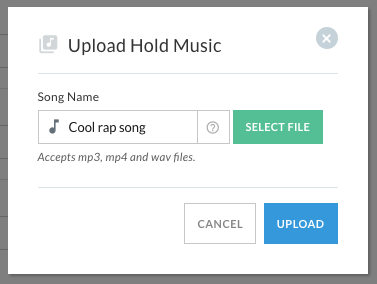 This means you can also provide Users with a wider selection of hold music choices for their individual extensions. And who doesn’t love to personalize their own user profile? With Telzio, you can easily add custom hold music to your phone system. You can choose from our selection of music, or bring your own. You decide what a caller hears when they are put on hold. In this article, you’ll learn about how to create on-hold messages and how to add hold music to your phone lines. Sometimes, wait times are unavoidable. Callers typically hang up after 5-6 minutes, but you can improve customer service during these crucial minutes with a little classical music, or a funny joke. When you play music, people wait longer and have better customer experiences. It also lets the caller know the system is trying to reach the desired party, so they're not left wondering if their call was lost. Messages on hold can be marketing driven, or answer frequently asked questions. It gives you an opportunity market your product or service, and deliver useful information to customers while they are already on the phone. Giving answers to common issues can lower your customer support demands, and free up agents to answer to more pressing matters. For example, you can let callers know that you also offer chat support online, and where to find how-to guides on setting up your product. Visit your Telzio Account Settings to add songs to your library of hold music. You can upload up to 10 audio files up to 5 minutes each. Once you've added your songs, they'll be listed under the default hold music choices in User Settings and in Call Flows. For a step-by-step guide on how to add custom hold music to your account, visit the support page. You don’t have to be a music producer or even close to one to record your own messages and mix them into a song. If you’ve never used a music program before, it might take a bit longer to learn and experiment, but you don’t need any experience to be able to pick it up. You don’t even need any professional equipment. Just your computer and built-in mic will do. There’s a program for Mac and PC called Audacity that you can download for free. Check out this YouTube tutorial on how to add a voice recording to a music file. From there, you can search for more videos on how to use Audacity to record and mix. If you’re not interested in spending the time on learning how to produce hold music yourself, we can do it for you. Use our in-house voice talent to record your message, and we'll add the recording over a piece of music. Just send us the script and music file, and let us know where you want to insert the voiceover message. If you don't have a song preference, just let us know the genre and we'll take care of it. Upon completion, your custom hold music+message audio file will be emailed to you, and added to your Telzio account. Email sales@telzio.com with your request.